In ‘The Flying Cat’ Jerry teams up with a canary, whom Tom wants to eat. 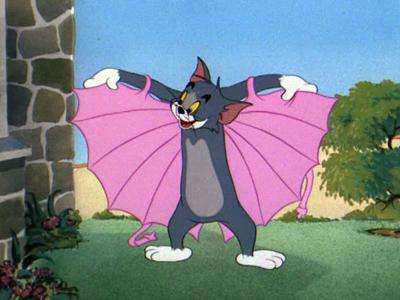 The chase routine that follows, gets an unexpected twist when Tom accidentally acquires some wings (out of a corset) and becomes a flying cat. It makes him a real threat to the two little creatures. Unlike the contemporary Tom & Jerry cartoons, the ugly ‘His Mouse Friday‘ and ‘Cat Napping’, ‘The Flying Cat’ uses the simplified character designs to great effects. The cartoon is fast and full of gags, many of which involving great and inspired deformations of Tom.